LADCO is a regional hub for expertise and data on air pollution emissions sources in the Great Lakes region. 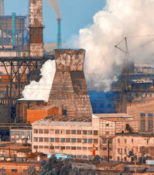 Data on the magnitude, timing, location, and chemical signatures of air pollution emissions sources are fundamental to accurately modeling air pollution. How can I access air pollution emissions data? The U.S. EPA Air Emissions Modeling website is a portal for visualizing and downloading emissions modeling software and data. To request LADCO emissions data files, contact our Emissions Director with specifics about the emissions modeling platform or data set in which you have interest. Contact the LADCO Emissions Director for more information about emissions modeling at LADCO.